Wake Island was the center of action last week when it anchored a test of the U.S. military’s multi-layered, integrated ballistic missile defense system. The irony is inescapable. Wake Island, where the absence of even the most rudimentary radar in 1941 doomed hundreds of Americans to devastating surprise attacks by undetected Japanese bombers, became the base of operations seven decades later for state-of-the-art missile detection and interception technology. The U. S. military confirmed the successful $230 million test on Sunday, November 1, 2015. According to several online sources (see links below) the event was a tightly coordinated test of multiple military services and multiple high-tech defense systems. 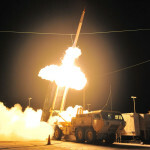 U. S. Army, Navy, and Air Force units from multiple combatant commands, the Missile Defense Authority (MDA), and test agencies participated in the exercise, which tested a layered operation of the Terminal High-Altitude Area Defense (THAAD) weapon system stationed on Wake and the Aegis Ballistic Missile Defense System aboard the destroyer USS John Paul Jones. Radar systems and a coordinated command, control management, and communications system conveyed essential data to the weapons systems. The appropriate titles and acronyms for everything can be found in the source links. As near as I can figure, the test, occurring around 11 PM on November 1 (Nov. 2 on Wake) went something like this: two USAF C-17 planes flying southeast of Wake Island fired three live missile targets; radar detected the targets, relayed tracking and fire-control information to the coordination suites, which cued the missile intercept systems. The THAAD system on Wake detected, launched intercepts, and destroyed both the medium-range and short-range ballistic missiles, while the Aegis system on the ship also fired an intercept at the medium-range missile (this attempt failed) and successfully intercepted and destroyed the anti-ship cruise missile target. The successful intercepts are cause for applause, but authorities argue that even the one failure in the test demonstrates the importance of layered defense: the “backup” succeeded. So more is better, which is good news for Lockheed-Martin (2014 net sales = $45.6 billion), which builds both THAAD and Aegis. The test was over in a flash, or more accurately in layers of flashes, late one night last week. But the preparations on Wake began several months ago as barges brought in tons of equipment and supplies and hundreds of soldiers, MDA personnel, and contractors swelled the population. Coordinating all of the elements of this joint exercise meant lots of wait time for the boots on the ground: just a drop in the $230 million bucket, but worth consideration. Wake has been involved, off and on, in the strategic and missile defense programs for decades as I discussed in an earlier post, Brilliant Pebbles. Remote, tiny, and out of the public eye, Wake Island continues to be a viable base for MDA operations. Not so long ago, however, it was on the opposite side of the coin. As tensions with Japan rose in the fall of 1941, Admiral Husband E. Kimmel (then CINCPAC) recognized that antiaircraft radar was essential to defense of the outlying Pacific islands. He had approved radar units for Wake and recommended even more, but none had been shipped by mid-November. The few radar units coming into Pearl Harbor by late November lacked essential accessories and spare parts, and there were very few trained technicians and operators. In Chapter 9 of Building for War, I relate how the first radar sets (under constant armed guard) and a skeleton crew of radar operators departed for Wake Island on the USS William Ward Burrows November 29, 1941, but they never made it. The Burrows, still at sea when war broke out, was turned back to Hawaii. Wake Island’s only “early warning system” would be a lone sentry on the water tower, dooming it to repeated, undetected attacks from Japanese bombers. I suppose the bright flashes from the nighttime THAAD intercept launches last week lit up the sky over Wake, maybe enough for the WWII monuments on the east shore to cast brief shadows, not that anyone would have noticed.